The restoration you choose will vary depending on the number of teeth you intend to replace. However, this does not necessarily mean that you will need an implant for each restoration. In the case for a single tooth replacement, you’d only need one implant-retained crown, which is screwed on top of the implant and designed to stay in place. There’s no need to remove it for cleaning or perform any special maintenance after placement. As long as your brush and floss it daily as well as visit the dentist every six months for cleanings, you’ll get decades of use out of it. Alternatively, fixed implant-retained bridges can be made to replace anywhere from three to four teeth at a time. This restoration is designed to have an implant attached to either end, therefore supporting one to two implants. Because these bridges are supported by implants, they will last much longer than traditional bridges, which rely on buffed down natural teeth to hold. Finally, those with extensive tooth loss can receive an implant-retained denture. This denture can made to be removable or fixed, depending on what your needs are. 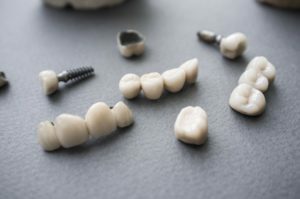 They are designed much like traditional dentures, meaning they have an acrylic base with porcelain teeth, but are customized to hook onto implants. Unlike traditional dentures, these prosthetics will look far more like a natural part of your smile. Keep in mind that all restorations are custom-made to blend in with your smile as naturally as possible. That doesn’t only mean that the restorations are shaded and blended to match the same color as your existing teeth. It also means they are shaped so they align with your bite. If the restoration causes your bite to become uneven, then it needs to be recreated. Uneven bites, whether they occur naturally or from restorations, can have huge negative implications if not shaped correctly. Once the restoration is fully fabricated and placed, it should look and feel indistinguishable from the rest of your teeth. If for any reason you aren’t happy with the outcome, the dentist will work with you and do everything they can to meet your needs. Got a question about your future restoration? Schedule an appointment to learn more about dental implants in Daytona Beach! Dr. Gladston Silva is an expert in implant placement and restorations. He earned his DDS degree with a specialization in prosthodontics, which focuses on the design, manufacture and fitting of artificial replacement teeth. If you want your smile to look natural by the end of implant treatment, he’s the dentist you want. To learn more about his practice, you can contact him through his website.